Capital Gazette Shooting Victims: The 5 Killed In Attack On Maryland Newsroom A gunman entered the offices of the Capital Gazette newsroom in Annapolis on Thursday and opened fire, killing four journalists and a sales assistant. We have profiles of the victims. 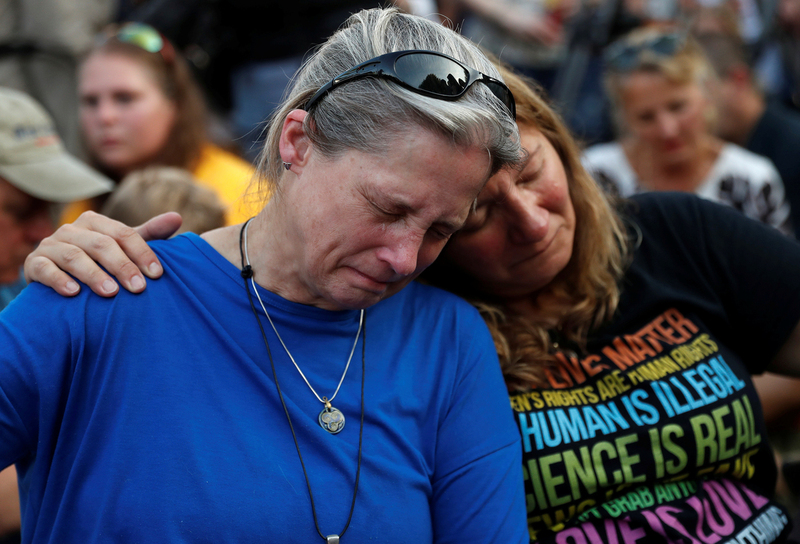 Community members Carol Geithner, left, and Yasemine Jamison take part in a candlelight vigil near the Capital Gazette, the day after a gunman killed five people inside the newspaper's building in Annapolis. "He had ability that, I thought, deserved a higher calling than The Capital," longtime editor and publisher Tom Marquardt acknowledged to the Sun. "He was a great writer. He was a really smart guy, so smart that he tried out for Jeopardy twice," Marquardt said, according to the newspaper. "But he couldn't get accepted because they didn't like his personality. That was Gerald's spin, anyway." Shanteé Felix, a former reporter at the Capital Gazette, posted on her Facebook page that, "He was shy and quiet, but a thorough editor who was filled with a wealth of knowledge. He was also a very sweet man." Married to a Mongolian opera singer, Fischman graduated from the journalism school at the University of Maryland in 1979, according to The Associated Press. Hiaasen shared the sardonic wit of his famous brother, author Carl Hiaasen. Rob's "wryly observant writing style and his generous mentoring of young journalists assured him of roles in several newsrooms, from The Baltimore Sun to, most recently, the Capital Gazette in Annapolis," the Sun's Jean Marbella writes. Hiaasen joined the Capital in 2010 as assistant editor after working as a reporter at the Sun for 15 years, according to the AP. The news agency says that prior to that, he had been a staff reporter at the Palm Beach Post and news anchor and reporter for radio stations across the South. In a post on Facebook, Carl Hiaasen wrote that he was "devastated and heartsick to confirm the loss of my wonderful brother Rob today," a man he said was "one of the most gentle and funny people I've ever known. He spent his whole gifted career as a journalist, and he believed profoundly in the craft and mission of serving the public's right to know the news." According to the Sun, he and his wife Maria, with whom he had three children, had celebrated their 33rd anniversary just days before he was killed. McNamara, who went by "Mac," loved covering sports and wrote extensively on the subject, according to the AP. Gerry Jackson is now a sports editor at The Baltimore Sun, but he spent two decades at the Capital Gazette. That's where he first met John McNamara. "He and I worked together for more than 20 years, our desks abutted one another," Jackson told NPR's Mary Louise Kelly on All Things Considered. "John was the rock of his family, and he and I had a great deal in common. We're both from big Catholic families – he was the oldest of seven, I'm one of nine. We clicked immediately." "When we had an opening [at the Capital Gazette], he was the first person I thought of. Not only because of his journalism abilities, but because I knew what a good person he was," Jackson said. According to The Baltimore Sun: "The University of Maryland graduate wrote two books about athletics at his alma mater. The University of Maryland Football Vault: The History Of The Terrapins," tracked Maryland football from its first game in 1892 through the 2008 season. "Cole Classics! Maryland Basketball's Leading Men and Moments" told the story of Terrapin basketball. He was working on a book about great basketball players raised in the Washington area when he died, [Baltimore Sun reporter Jeff] Barker said." The AP says he was married and loved local history, rock and folk music. Smith had only joined the Capital Gazette in November, according to her Facebook page. "She was a very thoughtful person," the Capital Gazette's advertising director, Marty Padden, was quoted by the Sun as saying. "She was kind and considerate, and willing to help when needed. She seemed to really enjoy ... working in the media business." On Facebook, Smith wrote about her battle against endometriosis – a condition creating abnormal tissue growth outside the uterine wall – calling herself an "Endo Warrior." She also described herself as a "Dog Mom. Softball Fiancé. Bonus Mom to the best kid ever." The AP says she was a Baltimore native and lived with her fiancé in east Baltimore County. According to the Sun, Winters came to journalism later in life after a career in fashion and public relations in New York, starting as a freelancer for the Capital Gazette 20 years ago. A former community news editor at the newspaper group, Leslie Hunt, said Winters was "dedicated and loved the work." "She loves the news business," Hunt said. According to the newspaper: "Winters covered all sorts of local news at the Capital Gazette, Hunt said, and wrote columns for the Home of the Week, Teen of the Week and Around Broadneck features. She joined the staff full-time in May 2013 after more than a decade writing articles for hire." The Sun writes: "Beyond the newsroom, she identified herself as a "proud Navy mom," a church youth adviser, a Red Cross volunteer and a Girl Scout leader who could "make a mean s'more." On her Facebook page, Winters described herself as having "Peter Pan DNA, blended with some extroverted introversion, sprinkled with proper punctuation marks and served half-baked with a Manhattan attitude." Painter, muralist and author Michael Bell, writing on Winters' page, said: "Wendi covered my career in art & education over the past decade [and] championed the community in countless ways," adding that "She always got the story right and is someone my wife and I always considered a friend."